The North Pennines is an area of high windswept moors and dramatic valleys, running north from the Yorkshire Dales almost as far as the line of Hadrian's Wall, and including the highest English fell outside the Lake District and a collection of impressive waterfalls. The North Pennines are separated from the Yorkshire Dales by Stainmore - the pass used by the A66 on its way from Scots Corner to Penrith. 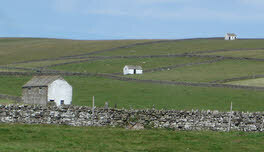 The North Pennines can be seen as a wilder and quieter sister to the Yorkshire Dales. 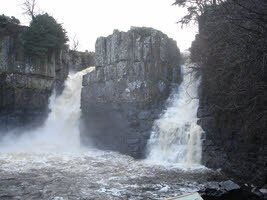 Teesdale is a match for the more famous southern dales, and its waterfalls, especially High Force and Cauldron Snout, out-class anything in the Dales. Teesdale can also offer a whole series of scenic reservoirs, with Cow Green the largest and wildest and the Grassholme and Hury Reservoirs offering a more pastoral scene. The valley also contains Middleton-in-Teesdale, an attractive small town with a good range of shops, including a very good hardware shop that is much bigger than it looks from the outside! 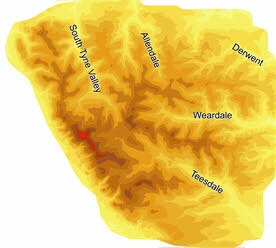 Weardale is a little more industrial, especially in its middle and lower reaches, but the upper part of the valley is suitable wild, and both Teesdale and Weardale end with high roads over into the South Tyne valley. Between the valleys are expanses of high wild moorland, often almost trackless and with very few paths - some of the more minor summits can really only be reached along rough land rover tracks or by cutting across the countryside (some of which can get rather wet). 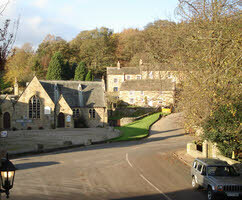 The area can also offer pretty villages, with Blanchland in the north-east my favourite and attractive towns. Alston, in the South Tyne valley stands out, both for its remoteness and for the quality of its food shops (look out for the Moody Baker). The most dramatic feature of the North Pennines is its western edge, a long steep escarpment that faces out towards the Eden Valley and the Lakes. Nearly thirty miles long the escarpment peaks at Cross Fell, the highest English mountain outside the Lake District, as well as High Cup, a dramatic gouge taken out of the hills. Most of this area is also free from roads, making it one of the remotest walking areas in England. To the west of the escarpment is a line of pretty villages, many good walking bases for the hills above. Little Salkeld can also boast an artisan miller, selling a wide selection of excellent flour. There are attractive small market towns all around the North Pennines. To the west is Appleby-in-Westmorland, famous for its horse fair but worth a visit in its own right. The middle Teess can boast Barnard Castle, an unspoilt but bustling town with an impressive castle, a lovely main street and with the most unusual Bowes Museum, with an impressive collection of art in a stunning building built in the style of a French chateau. To the north-east is Hexham, with a attractive centre and impressive abbey.